AP/M Permaform rehabilitate failing manholes and sewers using the Permacast and CentriPipe systems. 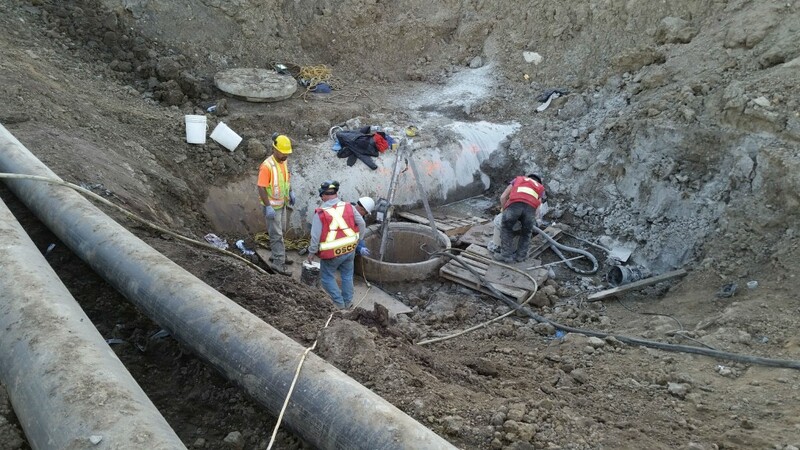 To withstand increased loads from a new overpass being constructed as part of the interchange project, a 145-metre section of existing 54-inch concrete sewer line had to be structurally rehabilitated. To facilitate this work, a new 9-metre (29.5- foot) manhole was installed to provide access at the section’s midpoint. The sewer was in reasonably good shape, but displayed microbiologically induced corrosion (MIC) in the top half, where concrete was exposed to hydrogen sulphide produced by thiobacillus bacteria. OSCO used CentriPipe to create a new concrete pipe within the existing damaged pipe. After dewatering, the CentriPipe spincaster was inserted into the pipe through the newly installed manhole, pushed to end points within the pipe, and withdrawn while pumping an engineered fine aggregate concrete to the spincaster. The material used was AP/M Permaform’s PL-8,000, mixed with ConmicShield, a concrete additive that inhibits microbial activity. Concrete treated with ConmicShield has been used for decades, and permanently prevents MIC. PL-8,000 is a fibre-reinforced cementitious mortar that adheres tightly to existing substrates – in this case, the original concrete sewer – so that no annular space is created for exterior water flow. In effect, a new smooth, structurally sound and waterproof concrete pipe is created within the old pipe. The fibre-reinforcement and other factors allow the use of thin layers, so sewer flow volume is only minimally affected. The compact spincaster enables cost-effective use of this solution in situations where other technologies, such as CIPP, are unworkable. The installed manhole was a new concrete ring structure that didn’t need rehabilitation. On the other hand, it is a large sewer installation that will remain important for access to a sensitive area, so the lead contractor asked OSCO to structurally reline this deep manhole to preserve it indefinitely. Surprisingly, the depth of the manhole was not really an issue. “Nine metres is unusually deep in this network,” Moroz concedes. “But it’s well within the capacities of the Permacast system. We set up over the manhole, lowered in the spincaster, and withdrew it while spraying on MS-10,000. Sewer flow was not affected at all.” Two passes were required to build up an inch of thickness. As with the sewer rehabilitation, the process casts a new, joint-free pipe within the original manhole, and manhole diameter is not significantly reduced. In addition to low cost and minimal disruption, another advantage of the spincasting solutions is speed; all told, OSCO spent just three days on site rebuilding 145 metres of sewer pipe and 9 metres of manhole chimney. Carmacks, Yukon, is in some ways the opposite of Edmonton; it’s remote, has a population of just 503 and its infrastructure is relatively undeveloped. “Basically, the sewer system is the only infrastructure – even water is trucked in,” says Darrell Peters, project facilitator at Yukon Engineering Services, Inc.
For OSCO, the main challenge was weather; at time of rehabilitation, nighttime temperatures were -15 degrees C, with daytime temperatures climbing all the way up to 5 degrees C. Herman Nelson heaters were brought on site and connected to 12-inch hoses that brought manhole barrels up to workable temperatures. OSCO also had to contend with insulated frost lids, a unique feature of Yukon manholes used to prevent sewer freezing in winter. Aside from those challenges, rehabilitation was routine. MS-10,000 mixed with ConmicShield was again used, and all six barrels, about 3 metres deep, were repaired in just two days. Peters considers the project a success, and says he is likely to use Permacast again. Given the extreme range of challenges successfully met by these two early projects, it’s likely that the complimentary systems will be used routinely throughout Canada. In the early 1900s, the New Milford Power Company successfully completed the first commercially viable hydroelectric power plant on the Housatonic River in Connecticut. The project, Bulls Bridge Development, broke ground in spring 1902 and was in operation by 1903. Bulls Bridge was named after the Bull family that had lived in the area for generations. In June , a select group of project officials, including Mexico's President Enrique Peña Nieto, celebrated the final breakthrough of an epic tunneling project. The 8.7 m (28.5 ft) diameter Robbins Crossover TBM is the first such hybrid machine to operate in North America, and it completed the Túnel Emisor Poniente (TEP) II on a high note. The TBM, known an XRE—a Crossover (X) between Rock (R) and EPB (E) TBMs—navigated fault zones, variable ground, low cover, and more to achieve a national record of 57 m (187 ft) in one day as well as maximum rates of 231 m (758 ft) in one week and 702 m (2,303 ft) in one month. IPEX, a leading thermoplastic piping systems manufacturer, revealed its recently completed Edmonton plant expansion to stakeholders and guests at a reception. The development represents a $55.4-million investment for the company. Composite materials are in demand as industries are experiencing hazards and injuries when using traditional steel and other metal products. Reports of crushed and amputated fingers and toes along with burns, back injuries and other ailments have given industries ranging from data centres to water treatment plants a reason to seek safer alternatives. In the United States in 2014-15 there were 3,675 incidences of reported injuries within the manufacturing industry alone. Thirty-two percent of these incidences were reported as back injuries which led to a total of 125,880 missed working days. Composites are an ideal solution to these problems due to their lightweight yet durable properties. By using lighter materials, operational injuries are prevented, worksites are made safer, and ease of installation and maintenance is made available to utility workers and contractors. As a PVC-friendly city, Summerside, Prince Edward Island planned to use PVC pipe as it began Phase II of its Pope Road watermain expansion project. The project required 300 metres of 400-mm (16-inch) pipe, and was taking place in an area of the city with no existing water line. Hobas Pipe USA is currently supplying pipe for the rebuilding of the 40-year-old Turcot Interchange, southwest of downtown Montreal. The project will continue for several years and is estimated to cost $3-billion. Tucked away on a small jobsite in a quiet neighbourhood bordering a busy interstate highway, a Robbins Earth Pressure Balance (EPB) machine underwent Onsite First Time Assembly (OFTA). The OFTA method allows for TBMs to be assembled onsite, and results in time and cost savings to the contractor. On November 17, 2014 unbeknownst to commuters driving by, the 6.65-metre (21.8 feet) TBM rumbled to life and began its journey south into the city of Seattle, Washington. One of the most effective ways of replacing a pipe using trenchless technology is pipe bursting, which replaces a traditional construction trench with launching and receiving pits that pull the new pipe through the existing one, breaking the old pipe into fragments that stay in the ground in-situ. Environmental concerns and mishaps have been the cause of many delays, cost overruns, shutdowns and legal implications over the years. Many people in the industry will read this and think that delays caused by environmental factors are a result of multiple, complicated or changing regulations. While these are sometimes contributing factors, the root of the problem starts with contract tenders, more specifically the way they are written or not written. It is only 120 metres across the Western Gap of Toronto Harbour from the Toronto waterfront to the Billy Bishop Toronto City Airport (BBTCA) but it still requires a ferry boat ride for passengers going to and returning from the airport on Toronto Island. The ever-increasing popularity of this airport with close proximity to downtown Toronto has pushed the ferry capacity to its limits. Working in underground construction, it’s common for utility contractors to encounter unexpected challenges. In fact, it’s those challenges that often test a company’s mettle, its expertise and its people. A successful outcome not only brings a sense of pride to those who were involved in the project, but can often cement a relationship with a customer that is both long-lasting and fruitful. Aegion Corporation has announced its subsidiary, Insituform Technologies Limited (“Insituform Canada”), has been awarded a $13.4 million (contract from the City of Montreal, Quebec, Canada to rehabilitate pipelines up to 130 years old, located mostly in residential areas in boroughs throughout the city. Downtown Toronto benefits greatly from the natural beauty of Lake Ontario providing it with a stunning waterfront that attracts tourists and local residents on a daily basis. Combining traffic, transit, tourists and other factors in an area that was designed and developed many years ago has caused a call for revitalization along parts of the city’s waterfront.